Keiwone Malone's high school coach on Nick Saban: "He did it the right way"
TUSCALOOSA -- Keiwone Malone's high school coach said today that Alabama coach Nick Saban did not violate NCAA rules in speaking with the Memphis wide receiver prospect. Mitchell High coach Nathan Cole said Saban "did it the right way," during a recent visit to Mitchell's campus the week before this year's Feb. 4 National Signing Day. 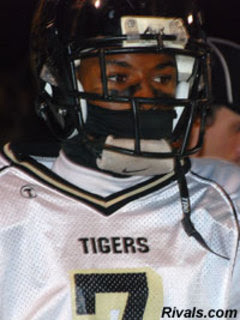 Malone wound up committing Feb. 5, becoming the first expected addition to the Crimson Tide's 2010 signing class. Cole's comments were in response to a Memphis Commercial Appeal column today that accused Saban of "full-contact recruiting." Under NCAA rules, a face-to-face encounter with Malone would have been a violation since coaches aren't permitted to speak in person to high school juniors. The rule's oft-debated gray area, however -- known as the "bump rule" -- allows a coach and prospect no contact "in excess of an exchange of a greeting," per Bylaw 13.02.3 of the NCAA rule book. It is permissible so long as the coach, "does not engage in any dialogue in excess of a greeting and takes appropriate steps to immediately terminate the encounter." That is how Cole described Saban's discussion with Malone. "They didn't really talk," Cole told the Press-Register. "(Saban) said, 'Hey, how you doing?' and 'I can't talk to him right now.' Really, it was like, 'Hey, my name is Keiwone Malone, and that was it.'" According to Cole's account, Saban came to Mitchell to "see some film on people," and that Malone initially wasn't at the school during that time. Cole said he was walking Saban to his car when Malone drove up in the parking lot. Cole said he pointed out Malone to Saban, who noticed the Miami Dolphins cap being worn by the prospect. "I had on my Dolphins hat, and he liked my favorite team, so we kind of bonded a little bit," Malone told the Commercial Appeal last week. "And when he started talking to me, I started liking the stuff that he was saying." Saban's visit did not occur during an NCAA-mandated Dead Period, as Malone is a junior and coaches were allowed to be on the road in late January. "They would say they can't talk to them," Cole said of visiting college coaches. "If I see (my players) in the hallway walking, I'm always going to point them out. My job is to get my kids into school, and that's what I'm trying to do. ... I just let them put a face to the name." Malone didn't commit or receive a scholarship offer during the face-to-face encounter, sources said. He called Saban the day after this year's Signing Day to commit, and the coach and prospect had a longer conversation at that time. Such contact is permitted. Cole would not say if additional colleges stopped in and spoke with Malone during the same period, but stressed of Alabama, "That's where the kid wanted to go." "He didn't want the pressure on him," Cole said of Malone's decision to commit early. "He wanted to go into the season focusing on his grades and playing football."